Choc Chunk Peanut Butter Cookies. You know the ones. Crunchy on the outside. All soft, chewy, peanut butter-chocolately goodness, on the inside. Guys, these cookies are good. Very good. My husband ate one and then wanted more. Generally, that wouldn’t be worth sharing, except in this case, we’re not talking regular cookies. Ah-uh! 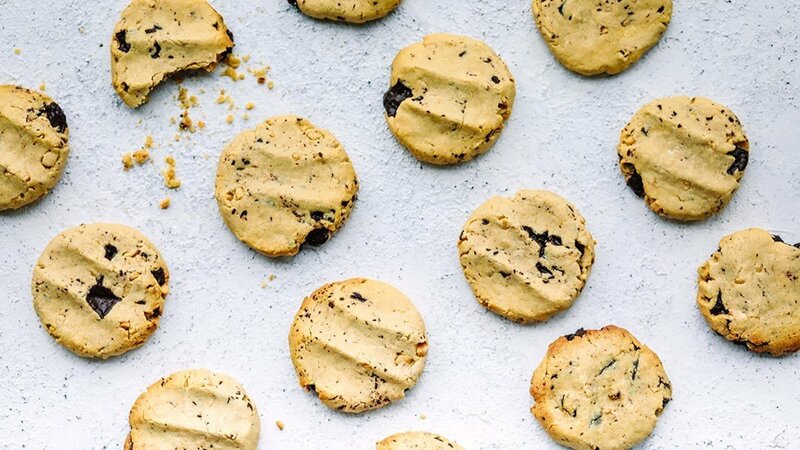 We’re talking cookies that are healthyish, but still completely delicious. 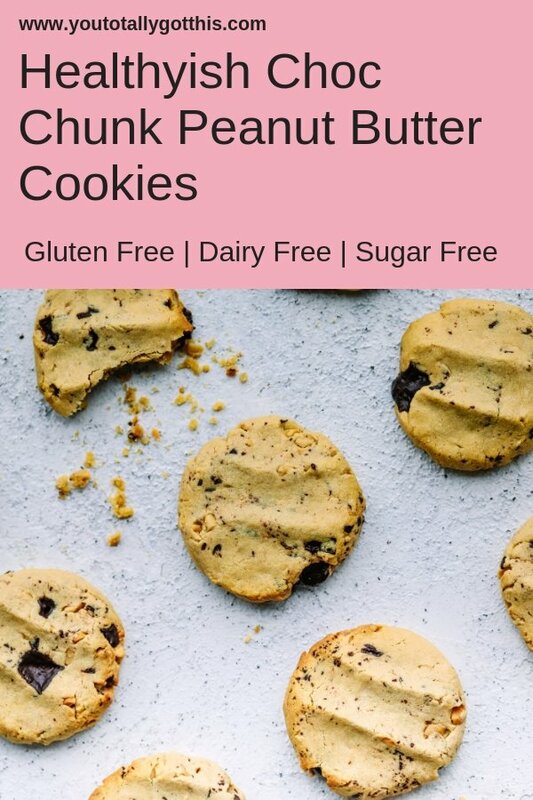 They have that awesome cookie taste and feel, but are low in refined sugar, gluten and dairy free. And hubby ate them. Voluntarily. No sweet talking required. I feel strangely triumphant. But, also disappointed. I mean, now I have to share my cookies. It’s a cruel world sometimes. If you’re a person that likes the highlights, this is what you need to know about my choc chunk peanut butter cookies. But heaps less sugar than a regular cookie. So easy! I’m talking, a Dump – Stir – Roll – Bake scenario. Oh hey, 20 minute-ish, not so naughty, treat. Peanut butter and chocolate in cookie form. It is a thing of pure joy, which you must experience. Because, it’s no fun being on a cookie high by yourself. Let me know how you go. Do they taste like low sugar cookies Yes/No? Author: Rani - You Totally Got This. Crunchy on the outside. All soft, chewy, peanut butter-chocolately goodness, on the inside. These 4 step, super quick and easy, Choc Chunk Peanut Butter Cookies, make low sugar, next level YUM! 50g dark chocolate, regular or dairy free, 85% cacao or above depending on your dietary requirements. Preheat your oven to 160C (fan forced) and line 2 baking trays with baking paper. Chop dark chocolate into small pieces and transfer to a large mixing bowl. Next add the peanut butter, egg, corn flour, rice malt syrup and vanilla essence. Mix all the ingredients until they are fully combined and form a dough. With damp hands take a teaspoon of dough, roll it into a ball and place it on the baking tray. 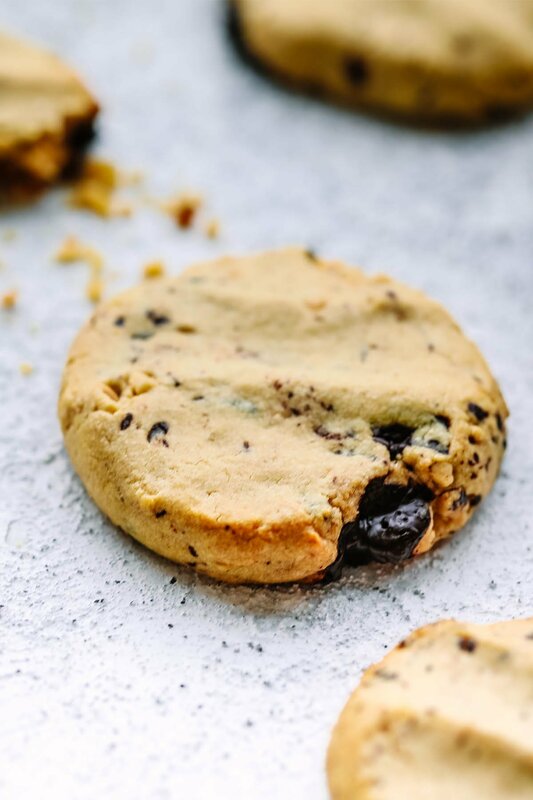 Use your fingers to flatten the dough into a cookie shape. Repeat with the remaining mixture. Transfer the cookies to the oven and bake for 10-12 minutes until they just start to go golden on the edges. Remove from the oven, leave to cool for 5 minutes and enjoy! If the peanut butter you use is extra oily, you might find that the dough is too sticky to roll into balls even with damp hands. Just add some extra cornflour one tablespoon at a time, to get the right consistency. The tops of the cookies will be soft when you remove them from the oven. That’s totally okay, they will firm up as they cool. I wouldn’t count on it, but if you have any cookies left over, store them in an air tight container, for 5-7 days. You can easily make your chocolate chip blondies totally refined sugar free, by using a sugar free dark chocolate, like Lindt No Added Sugar Dark Chocolateor Loving Earth Chocolate for a dairy free option. If you suffer food intolerances or allergies, please make sure all the ingredients are safe for you to eat. I used White Wings corn flour and Pure Harvest rice malt syrup, which say they are gluten free on the packaging. P.S – Now we’ve got your snacks sorted, let’s get your dinner sorted too? Grab your FREE quick and easy weeknight dinner plan right here. 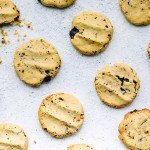 I love these cookies and when I made them I stashed half the mix in a log shape in the freezer and they cooke brilliantly from frozen (add a minute or two extra cooking). Ohmygoodness Nic! That is and absolutely brilliant idea. You clever, clever thing. I’m guessing you could just cook one, one at a time if you felt like one after dinner. I am so going to so this too. A lawyer, Netflix addict and total expert at getting dinner on the table fast. Sign up to get all the latest delivered to your inbox every month. Plus, a 20 Minute Meal Plan to get you started. Your Meal Plan is in Your Inbox. Go!